How Can Air Purifiers Help You Breathe Better? Air Purifiers have HEPA filters or Carbon filters that assist with cleaning and purifying the air that is circulated in your home. 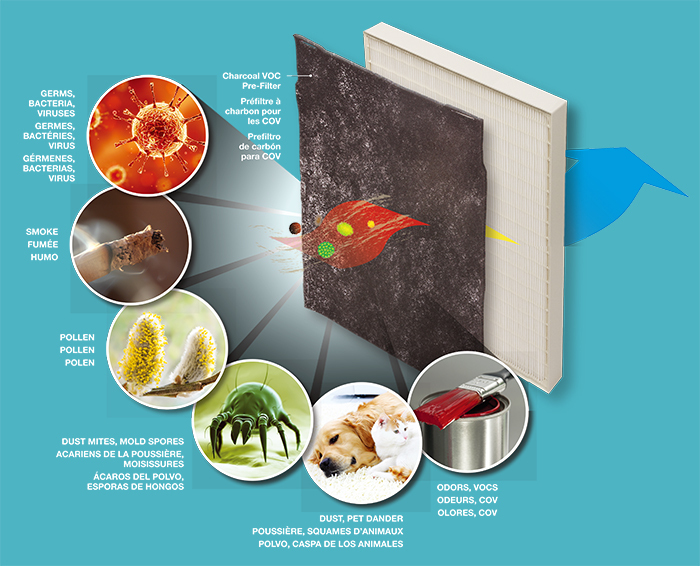 HEPA stands for high-efficiency particulate air and is a type of air filter that purifies the air by trapping tiny particles, invisible to the naked eye, that normally get recirculated in the air by a vacuum. According to a report by ConsumerSearch expert tests, the HEPA filter removes about 99.9% of dust particles and impurities from the air including pollen, mold, spores, pet dander, and/or dust mites. If you suffer from asthma, allergies, or any other respiratory condition that could be worsened by airborne particles, an air purifier may provide you with some relief. Air purifiers are especially important in houses because they quickly and quietly clear allergens and other particles, effectively remove odor, pollen, smoke, dust, pet dander, and almost all other pollutants present in the air. Without an air purifier, your house could collect lots of dust and germs, which could lead to health problems. In addition to a smoking habit or a relative that smokes, a lot of us might share our homes with our pets, which brings with it urine stains, pet odors, and dander. These can be quite upsetting for family members who have allergies and, most of the time, vacuuming doesn’t remove all the pollutants in the air. Do I need an air purifier? According to the Environmental Protection Agency (EPA), there's more and more scientific evidence that indicates air within homes can be more seriously polluted than the outdoor air in even the largest and most industrialized cities. In addition to that, other research indicates that people spend approximately 90% of their time indoors. Putting the two together, for a lot of people the risks to health may be greater due to the indoor air pollution. Inside your house, pollution sources can come from pet dander, pollen, cleaning solvents, mold, bacteria, gas, plastics, smoke, dust and etc. WIth an air purifier, you can filter out odorous and harmful particles inside your house and give yourself cleaner, healthier air. Are there different types of air purifier? Many of the air purifiers you see on the market uses HEPA filters. HEPA is a type of mechanical air filter that traps at least 99.97% of all particles larger than 0.3 microns. It works by forcing air through a fine mesh and traps harmful particles such as pollen, pet dander, dust mites, and tobacco smoke. The more times the air passes through the HEPA filter, the cleaner the air will be. Eventually, the HEPA filter will become full and air will no longer be able to pass through the filter and a replacement HEPA filter is needed. The ionic generator sends out a studay source of negatively charged ions and attract allergen particles, dust, and other harmful particles. Once the newly formed particle is too heavy, it will no longer remain in the air and drop and attach itself to the floor, wall, or window. Technologically speaking, the ionic air purifiers sounds advanced, but it will require additional cleaning to be able to remove the harmful particles that's now stuck to the wall or floor. Most people should be familiar with UV. UV air purifiers have a UV lamp installed inside and the electromagnetic radiation from the UV light kills germs, bacteria, and pathogens that might be in the air. Though useful in killing germs and bacteria, it is not able to remove the allergens, dust, and other odor particles such as smoke from the air. Because of this, many people use UV air purifiers with HEPA air purifiers together to clean the air. Ozone air purifiers work by basically pumping ozone (O₃) into the air, a strong oxidant gas which can oxidize many chemicals. This is very effective in cleaning mold, mildew, and odor particles. However, health professionals have refuted the useful claims of the ozne gas and that exposure to it could cause some health concerns. CADR stands for Clean Air Delivery Rate. It indicates of the volume of filtered air delivered by a portable air purifier. "The CADR is a measure of a portable air cleaner’s delivery of contaminant-free air, expressed in cubic feet per minute. For example, if an air cleaner has a CADR of 250 for dust particles, it may reduce dust particle levels to the same concentration as would be achieved by adding 250 cubic feet of clean air each minute."